BASED on the critically acclaimed, record-breaking play, 'Ghost Stories' follows Professor Philip Goodman (Andy Nyman), a renowned sceptic of all things supernatural. His idol, psychologist Charles Cameron, who had mysteriously disappeared, reveals to Goodman that he has been in hiding since realising his own arrogance in trying to rationalise the spirit world. Accusing Goodman of the same disrespect, he gives him three case histories to solve: a night watchman haunted on the job; a troubled man confronted whilst broken down in a forest; and a city trader (Martin Freeman) disturbed by strange goings on as he awaits the birth of his first child. Each baffling, horrifying case supports the existence of unseen forces, taking a toll on Goodman and everything he has ever believed. To celebrate the release of 'Ghost Stories' in cinemas, we're giving you the chance to win a double pass. Like our page on Facebook, follow us on Twitter or Instagram, or become a member on SWITCH. Complete your details below. Members can sign in at the top of this page to have their details automatically filled in. All fields are compulsory. Competition opens at 5pm AEDT on Sunday 14th October 2018 and closes at 11:59pm AEDT on Sunday 21st October 2018. Five winners will be chosen at random on Monday 22nd October 2018. To successfully win, entrants must fulfil the above entry conditions before the time the competition closes. Current members/followers are eligible to enter the competition. Only one entry per person. Only one winner per household. To be a valid winner, the entrant must not have won a prize from SWITCH within the last 28 days. 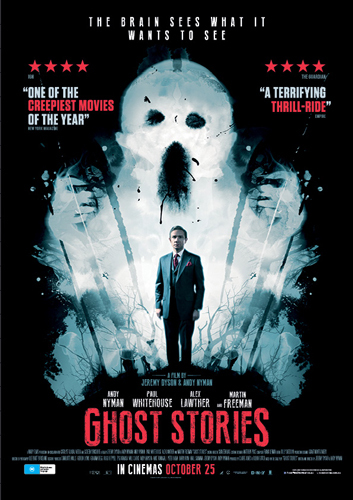 Each winner will receive one double pass to 'Ghost Stories'. By entering, you agree to receive occasional emails from SWITCH in the future. If you decide to unsubscribe from these updates, any further entries will not be applicable. Only Australian residents are eligible to enter.